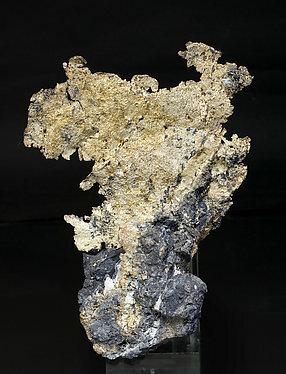 In the classic mine of Las Herrerias recent activity has exposed an enriched zone where Silver was then found. These are similar to the samples found years ago, which are present in many of the most important museums worldwide. The latest specimens have a high (±10%) content of Mercury and some of them are on a matrix of red Jasper. 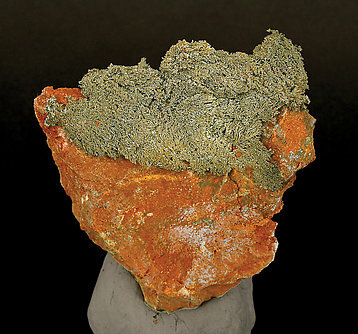 Analysis has shown that they have a large amount of Chlorargyrite throughout the specimen. As is normal we will send the person that buys this one a copy of the analysis. This one is one of the best that they found, and it is very solid. So overall an outstanding specimen from the find. 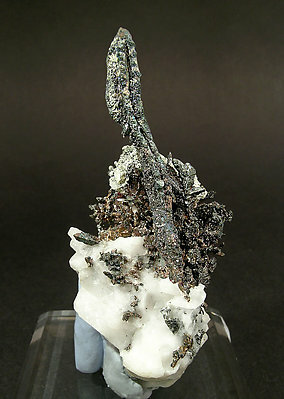 Dendritic growth of extraordinarily elongated crystals with the very visible spinel law twins and black Acanthite surfaces. Its excellent condition of preservation in spite of the long time since it was mined (the sample is from a collection of the 80s-90s) suggests it has no embedded or interstitial mercury. 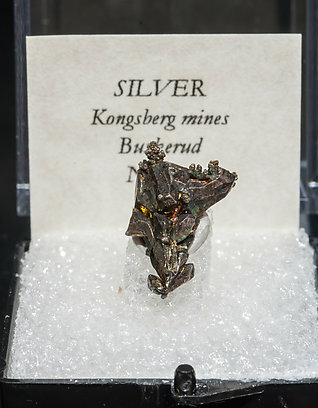 It is not, then, the variety kongsbergite, the more typical Silver at this locality. Arborescent growth of very elongated octahedral crystals with very well defined faces and edges and very bright. An excellent Norwegian classic that we’ll send in its original Perkin’s box from the R.J. Noble collection, also containing the collection label in which it appears that it had previously been in the Sullivan collection. A wiry growth of strongly elongated crystals with the very well defined spinel law twin. An excellent European classic. Extraordinarily elongated octahedral crystal, with a very sharp spinel law twinning, with very well defined faces and edges and very bright. A great Australian classic that we’ll send in its original Perkin’s box from the R.J. Noble collection, also containing the collection label in which it appears that it had previously been in the Willis collection. 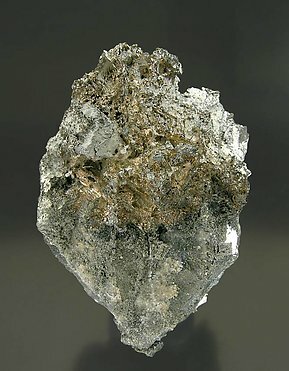 Floater aggregate of strongly elongated Silver crystals with very well defined terminal faces and one of them doubly terminated. A very nice and fine piece. Dendritic growths of thin elongated crystals that have a very good luster and color. On matrix, with Calcite. A plate from a fissure of microcrystals with skeletal forms, on matrix. The piece is from an old find in Imiter, probably around de decade of the 90’ts and unusual as the habitual it has a crystalline aspect. Fissure plate of micro-crystals on matrix. The sample is from an old find at Imiter, probably around the 1990'ts. 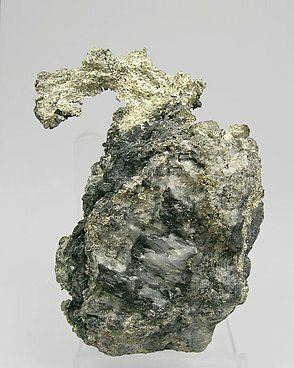 Its luster and fresh aspect suggest that it has no mercury and it is native Silver and not the variety kongsbergite, very common at this locality. A scultural growth, very aerial and esthetic, of microcrystals with skeletal forms, on matrix. The piece is from an old find in Imiter, probably around the decade of the 90’s and unusual as the habitual has a crystalline aspect. 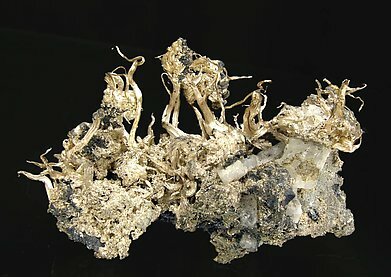 Laminar growths of native Silver on matrix. 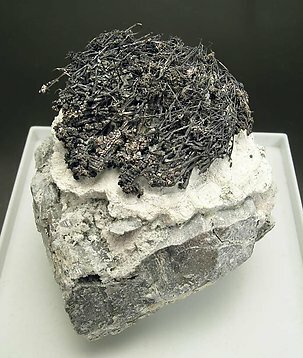 This sample, a magnificent Moroccan classic, is preserved in mint condition in spite of the many years since its extraction, due to it’s not being combined with native Mercury (Kongsbergite), unlike what happens with the majority of the samples from Imiter. 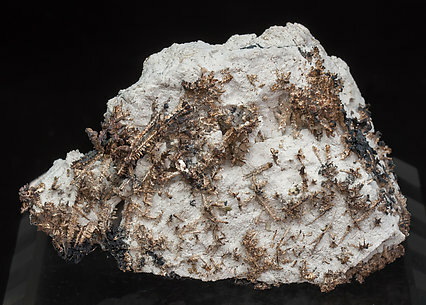 Aggregates of very elongated Silver crystals with very notable wire growths and with aggregates of small, very bright Quartz crystals. A great sample of a great European classic. A great classic. 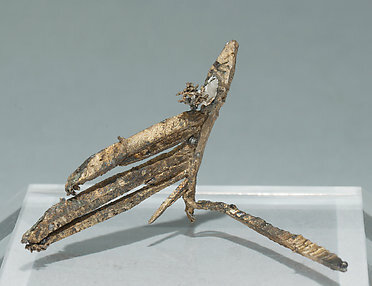 The specimen is splendid, very esthetic and on matrix, with elongated crystals having acute terminations and well-defined faces (a rare feature with Silver specimens), and arborescent growths. 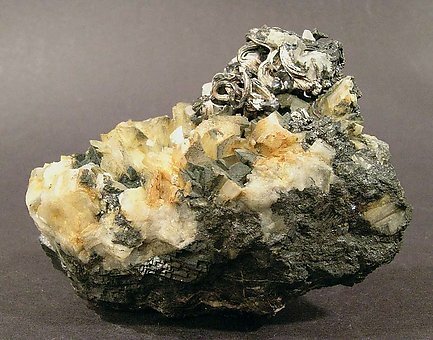 Some very small green Sphalerite crystals appear on the tops of some of the Silver crystals. The growth is laminar which is uncommon in the samples from Falset. 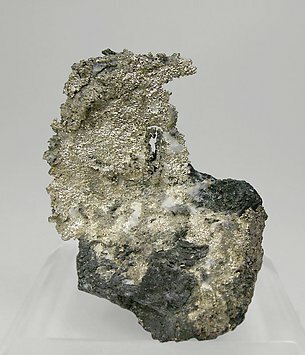 Another aspect to distinguish the specimen is that it hasn’t been etched out with acid because the Silver is found in fissures and is not included in Calcite. Hooked and skeletal growths on matrix. We note that from this locality, and very similar in their aspect, there are samples named as Allargentum (Ag7Sb). We analyzed the specimen and, in this case, it is simply native Silver. Arborescent growth, very esthetic, of thin, elongated crystals with well defined faces and edges. We also note the locality, an American classic for Silver. 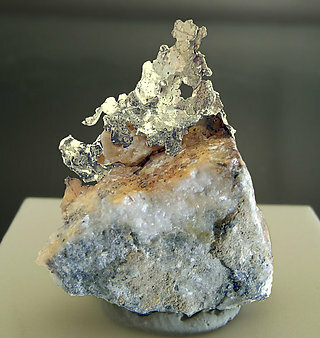 Arborescent growth that, from the base to the upper zone, developed progressively taller crystals that have better developed crystalline forms. A good sample. 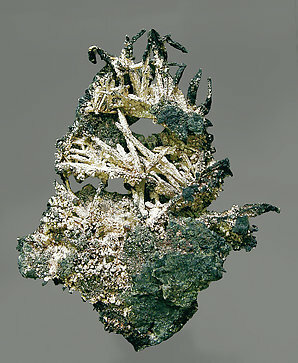 This is a really great sample, very esthetic, with the branches of the Silver very aerial, and clearly showing the Spinel twinning. 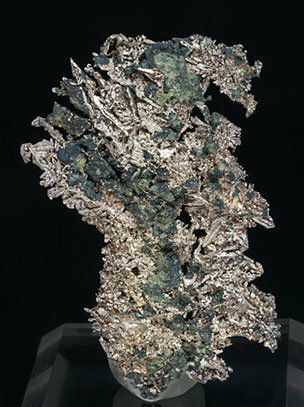 This form is not that uncommon in the silvers from Mexico, but it is not normally this obvious. So, as we said, a great one. The specimen has been reviewed, photographed and published in the magazine ‘Rivista Mineralogica Italiana’ on page 245 in number 2005/4. 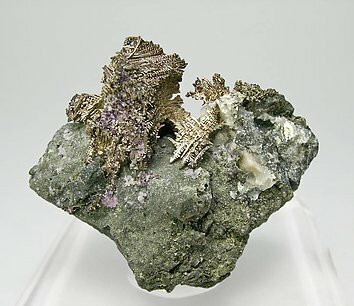 A very unusual growth of native Silver that has replaced completely, pseudomorphing them, the original crystals of Dyscrasite that formed the group. Exceptional by its rarity. 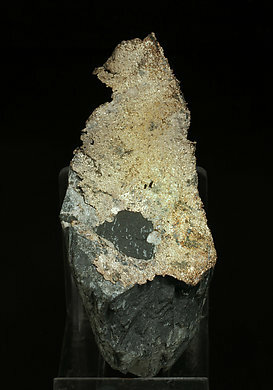 The specimen has been photographed and published in the magazine ‘‘Mineral Up’’ on page 33 in number 2009/1. In this one I have allowed Jordi to speak: Very beautiful native silver from Freiberg with two really interesting additions: well-crystallized Stephanite and an old 19th century label, which is written in ink. A quality classic. 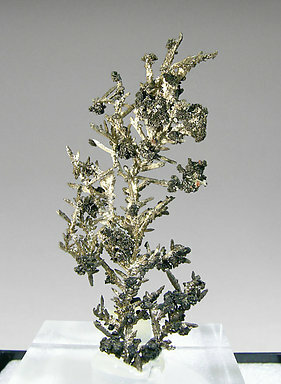 Dendritic growths of strongly elongated native Silver twinned crystals that conserve very fresh surfaces contrasting with the black Arsenic matrix. 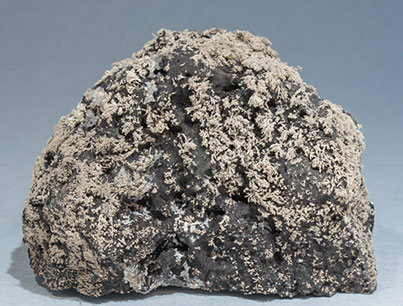 The sample is from a classic German locality and it is from the Vallecillo collection, from Madrid. Nice specimen, very aerial and esthetic. 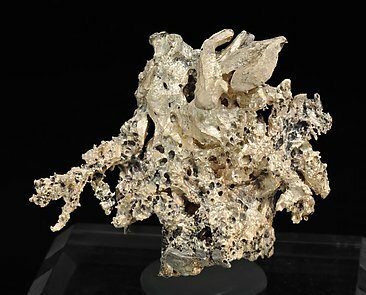 Hooked and curved wire-like growths of native Silver on a rich Baryte matrix that contrasts with the darker deformed pseudoctahedrons of Acanthite. 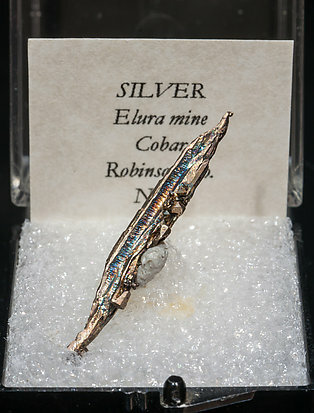 Very esthetic specimen with a color and luster of the Silver that is very attractive. 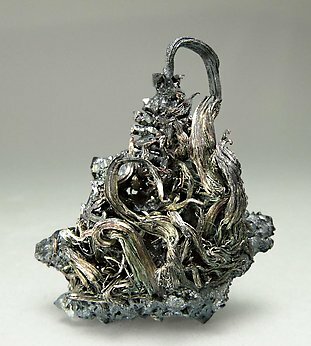 Hooked and wirelike growths of native Silver on Acanthite. After the questioned wire Silver samples from other localities we have carefully checked this specimen and due to the perfect condition of the Acanthite we can certify that the Silver wires are totally natural. This locality is a German classic for Silver. 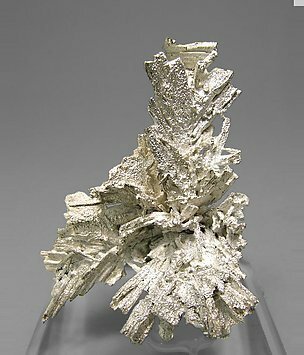 Native Silver crystals are elongated and form a complex “nest” in which they are partially covered by small dark crystals of Acanthite. 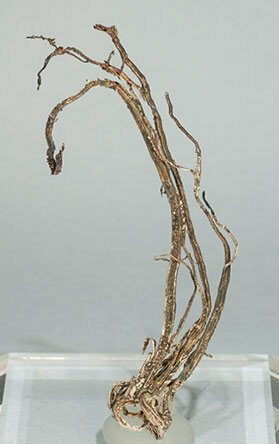 The group is very aerial and stands prominently on a matrix etched with acid to expose the Silver. Fine dendritic growths of native Silver with the well-known “feather-like” shape. They are on matrix with Calcite. 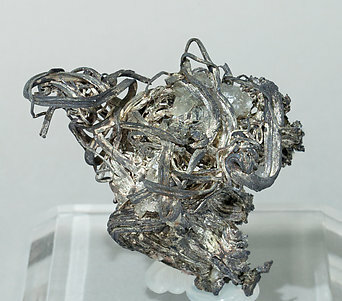 The Silver, even though a long time has passed since this was collected when the first discoveries were done at the locality, is very well preserved. It is clean and bright and contrasts nicely with the deformed octahedral Acanthite black crystals.